Quickly smooth enhanced and natural nails with this three-sided sanding block. 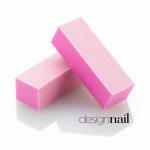 Contains 20 three-sided pastel pink sanding blocks with grits of 100/100/180. Size - 3 7/8" x 1" x 1". Made in the USA. Original item number: HBWB10P.